My dedicated server box not only serves Web applications (such as this blog), it also handles mail for the respective domains. This means I have to deal with spam. Which on one hand is nice because I can do whatever I please: drop mail based on whatever criteria I set up, and use whatever filtering software I need. This is how the NoSpamToday! SMTP Proxy found its way on my box. 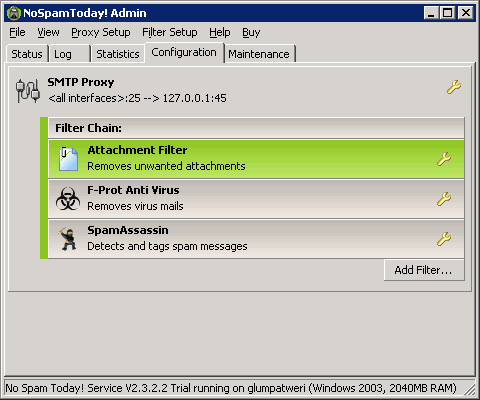 I simply got tired of maintaining my (rather old) standalone SpamAssassin installation, and dealing with MailEnable's integrated but not chained RBL / SPF / virus scanning (by not chained I mean that those filters are evaluated separately, not like SA, where all filters[rules] are weighted and evaluated as a whole). Because I only have one box, I had to resort to relocate MailEnable to port 45, so that NoSpamToday! could listen on 25 and forward to MailEnable if appropriate (*). I did configure SMTPS previously (port 465 redirected to localhost:45 via stunnel), so standard users could deliver their mail directly to MailEnable instead of having their outgoing mail scanned by the proxy. But what about my Web applications? Initially, those were sending to localhost directly, and as such I had a relaying exception set up in MailEnable. This one had to go, obviously. So how can applications deliver mail to the mail server via the proxy? SMTP authentication is necessary for this to happen. But this doesn't solve the whole issue, it opens a can of worms, performance-wise. The problem is, every single application (Community Server, dasBlog, Gemini, ...) assumes that your SMTP server listens on port 25. Wrong. That's the proxy. And that's a problem: all local outgoing email from those applications is scanned by antivirus and antispam filters. And that's completely wasting CPU resources. As well as adding to # of addresses accepted by the backend mailserver, driving up the licenses that would be needed for NoSpamToday! (**). Call to action: Implement not only SMTP authentication in your applications, but also make the SMTP server port configurable. I'm guilty as well.